Dr. Nirav Patel and the team at Smile Solutions Dentistry make taking care of your smile as convenient as can be. How? Our office is located in the Shoppes of Ibis. You can combine a visit to our office with a grocery-shopping trip to Publix, an appointment to have your haircut at Supercuts, or a quick bite to eat at Subway. And we’re here, too, to make sure your smile is healthy and beautiful. 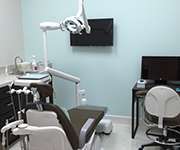 Smile Solutions Dentistry is located at 10130 Northlake Blvd., Suite 118 in West Palm Beach. We treat patients from the immediate area as well as those traveling a short distance from Palm Beach Gardens, Loxahatchee and Royal Palm Beach. Our office is located a few minutes west of the Florida Turnpike. You may have noticed that some dentist keep “banker’s hours.” Not Dr. Patel. He and his staff are here five days a week because we want to offer you as many options for scheduling as we possibly can. Of course, in urgent situations, 24/7 emergency dentistry appointments are available. Call our office immediately if you or a loved one is experiencing a knocked-out tooth, a broken tooth, a loose filling or dental crown, a severe toothache or a dislodged tooth. A South Florida native, Dr. Patel completed his undergraduate studies at the University of Florida, receiving a Bachelor of Science degree in Interdisciplinary Studies with a concentration in Biology. He studied dentistry at the University of Pittsburgh School of Dental Medicine. After dental school, Dr. Patel completed a 1-year Advanced Education in General Dentistry residency program in Flagstaff, AZ. The residency training as well as his work experience in both private practices and public health dental facilities now allows him to offer patients the most up-to-date treatments along with the latest techniques and technology. To schedule an appointment with your dentist in Palm Beach Gardens, contact Smile Solutions Dentistry today!